A recent Windows 10 update has introduced a bug in the Windows video components which causes Opus, and many other programs, to crash when handling video files. Microsoft have released KB4015438 which looks like it should fix the cause of the crash. If you download and install Directory Opus 12.4 as of today (March 20th), you should not need to do anything extra. We just updated the 12.4 installer so that the workaround below is done automatically. Go to Settings -> Preferences / Viewer / Plugins. If the Generate Thumbnails option is on, turn it off. You will still get thumbnails for movie files, just via a different route which does not trigger the bug, and without the film sprockets on the sides. Recent Windows 10 updates have introduced a crash in the AreDvdCodecsEnabled API. We do not call that API directly, but when we ask the Windows video components to handle an MP4 or MOV file, those components use the API and trigger the crash. Presumably this is because the components are disabled on some non-media versions of Windows, and they need to check. Several Directory Opus users reported crashes with MP4 or MOV thumbnails after recent Windows 10 updates. Our own investigation of crash dumps sent by our users pointed to the AreDvdCodecsEnabled API. Microsoft forum thread about crashes in AreDvdCodecsEnabled introduced in KB3216755, which mentions PowerDVD, DVB Viewer, Power Media Server and even Windows Media Player. Opening a folder containing MPEG2 files crashes dllhost/COM Surrogate, with reports of it still happening within the last couple of days and more recent updates. Plex ran into similar problem with an update in January (possibly a Windows Insider preview version of the update which has now been rolled out to normal Windows 10 users). The Plex team found their own workaround and Plex is no longer affected. Another Plex thread which mentions several other programs also having problems, and has some more detail. KB3216755 seems to be the cause, and is included in a recent roll-up update. Given the widespread problems the Windows update is causing, we expect Microsoft are aware of it and will fix it soon, but the workaround at the top of the post should let you avoid the problem for now, at least in Directory Opus. You may find other video software is still affected, and it's also possible you may still find problems in other parts of Opus (e.g. playing videos in the viewer panel, depending on which viewer is used) until the Windows 10 bug is fixed. If you still get movie thumbnail crashes, or if you had been seeing them for a while, then the Windows 10 update may have added to the problem but won't have been the only cause. You probably have a bad video codec or splitter DLL installed on your machine. 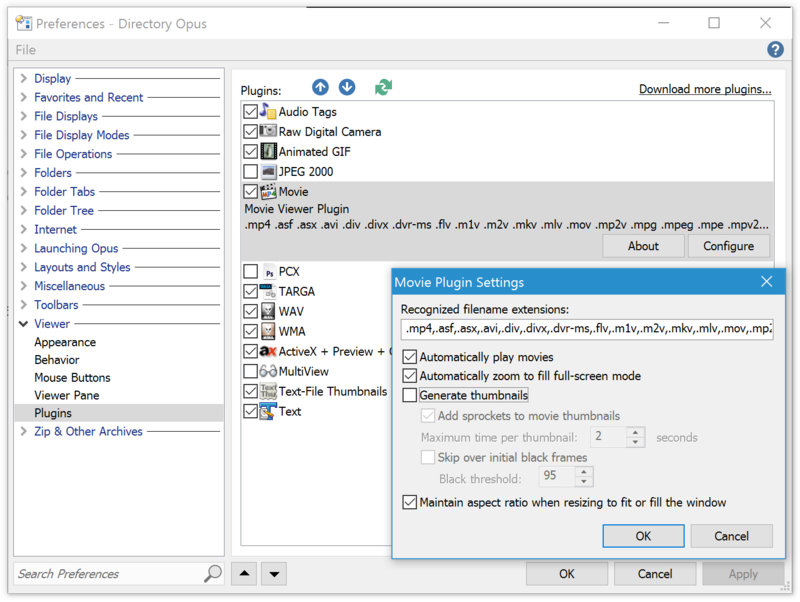 The guide, HOW TO: Enable/fix playback of various media formats in Opus, has suggestions on fixes for more general problems with video files. Another guide, Crash, exit or high CPU when viewing certain directories, has more general troubleshooting steps should you be seeing crashes with certain files or folders.